With one day in Ljubljana, you may struggle to check out all of the architectural landmarks, culinary treasures, and breathtaking views. The capital and biggest city in Slovenia has become a prime example of green living. Over a decade ago, the congested urban centre would hardly have made a list of the best travel destinations. Now, however, after going green, you’ll find the city a vibrant, pedestrian and cyclist-friendly paradise with a great mix of attractions to lure you in. If you plan to travel to Slovenia, it’ll be hard to overlook this city that was named the EU Green Capital in 2016. Need help deciding what to see while you’re there? Start planning your trip with this complete 1-day Ljubljana itinerary. 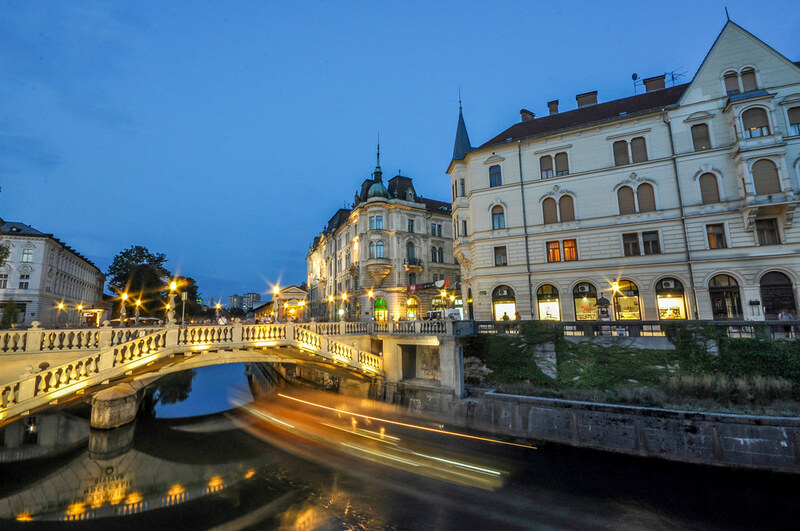 Ljubljana has something for every tourist, whether you seek ancient architecture, amazing food, or a busy nightlife. 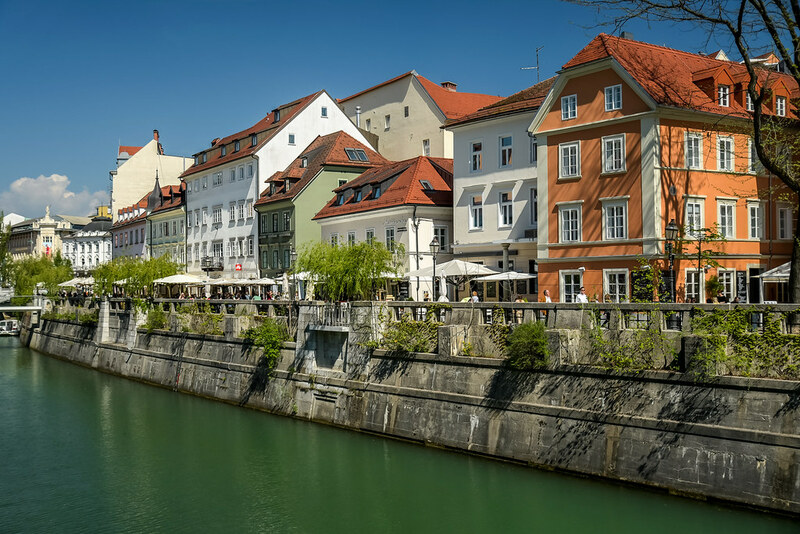 From the banks of the Ljubljanica River that cuts through the city centre to cafes with plenty of outdoor seating, it’s a delightful city that rivals the best metropolises in Europe. While 24 hours may not seem like a lot of time, it’s still plenty of time to see most of Ljubljana. Where to start? Like most of our one-day city itineraries, this Ljubljana itinerary takes you to areas that you cannot miss out on. Explore a castle, take a stroll through a park, and enjoy shopping at one of the city’s biggest markets. To see most of Ljubljana in 24 hours, it helps to start in the centre. Preseren Square is one of the most central points, making it the perfect spot to begin your adventure. From the square, you can see the top of Ljubljana Castle. You’re also surrounded by historic buildings containing various shops, cafes, and restaurants on the first floors. Before you leave the square, grab a quick bite of from one of the cafes or vendors in the square. 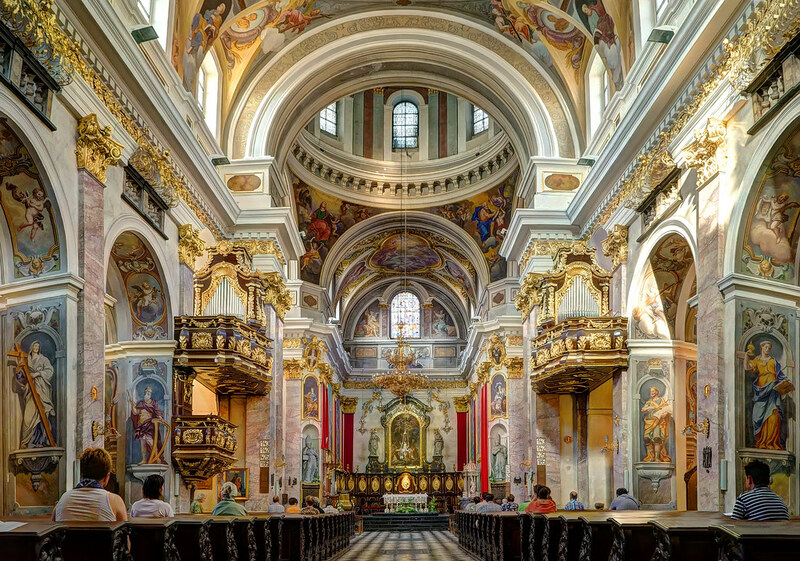 You can eat your meal as you check out the surrounding buildings, including the baroque Franciscan Church. The church is called the “Pink Church,” but it was originally painted red. Over time, the paint faded, resulting in the pinkish hue that it has today. On a longer trip, you could take a tour of the church. For now, enjoy the façade as you finish your breakfast. After finishing your meal, it’s time to cross the river. Right next to Preseren Square is Triple Bridge or Tromostovje. It’s one of several footbridges that take you from the modern part of the city to Old Town, where you’ll find the castle, the central market, and most of the other attractions. When trying to see as much of Ljubljana in one day as you can, you’ll have the chance to cross several of these footbridges. Triple Bridge gets its name from the fact that two bridges needed to be added to keep up with the heavy pedestrian traffic. The main bridge is a wide concrete bridge, flanked by two smaller bridges. It’s a beautiful part of the city and often one of the most crowded areas. Tourists tend to take their time crossing, stopping to take photos near the river. Crossing the bridge, you’ll come to Mestni Trg or Town Square. 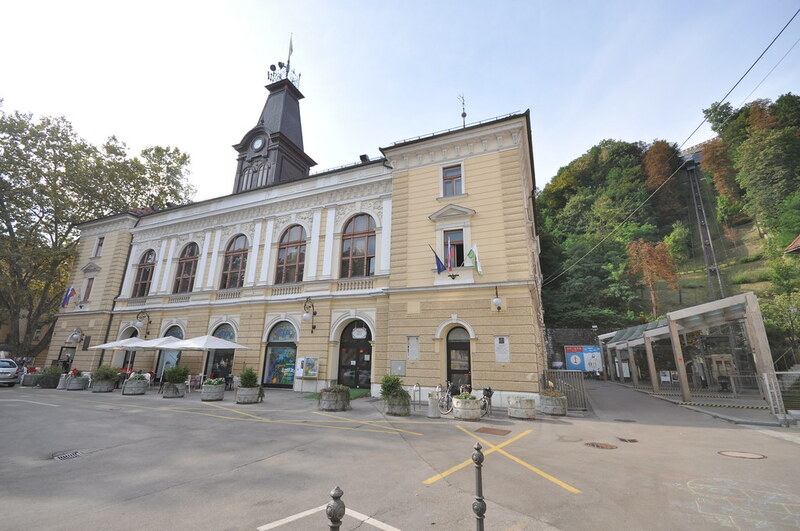 The heart of the city, Mestni Trg is another popular public square surrounded by beautiful baroque architecture. Built after a major earthquake in 1511, the square houses many restaurants and shops. The highlight of the square is the Robba Fountain in front of Ljubljana Town Hall. The fountain features three male figures holding jugs standing around a central obelisk that reaches 10 meters into the sky. The square is smaller compared to Preseren Square, but equally interesting thanks to the architecture and sculptures. If you couldn’t find an open spot at the previous square, you should be able to find a vendor or café here. If you happen to visit Ljubljana during Christmas time, the square is also lit with festive decorations, transforming it into a magical holiday destination. Just a block away from Mestni Trg is Ljubljana Cathedral. The green domes and yellow façade stand out when you see it from the centre of the square. Ljubljana Cathedral is one of the most recognisable sites in the city and an important destination for any Slovenia itinerary. Originally built like a gothic church, the building now features the baroque style that’s found throughout Old Town. It’s officially called the Cathedral of St. Nicholas. While the exterior deserves several minutes of appreciation, the interior is truly majestic. It looks like what you’d expect from an historic church, featuring golden embellishments on every wall. The ornaments, sculptures, and ceiling are remarkable in their grandeur. It’s easy to zone out while taking in all the décor, but you’ll need to keep moving to stay on track. The cathedral and many of the other sites in Old Town are built up along the banks of the river. 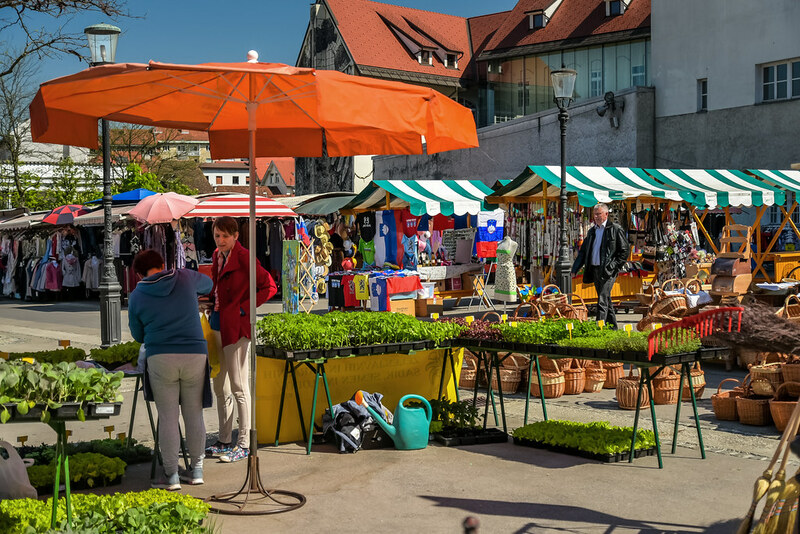 Continuing your tour along the river, you’ll reach Ljubljana Central Market. The open-air market is always bustling. You can find just about anything when browsing the various stalls and stands. Snacks and souvenirs await you. You can even find a vending machine that sells fresh milk from local farms. Vendors also sell local sausages, honey, chocolate, cheese, and just about any food you can think of. As a major tourist attraction, most of the vendors speak English fluently. You’ll have no problem bartering or inquiring about their goods. The market and other sites that you’ve visited are along the river and at the bottom of Castle Hill, offering views of the castle complex. The Ljubljana Castle is at the top of the list of things to do & see in Ljubljana, but first, you’ll need to get to the top of the hill. There are two ways to reach the destination – hike up the hill or ride the funicular train. The hike is short, taking only about 15 minutes, but the train is more entertaining. The funicular ride will also shave a few minutes off the trip, giving you more time to explore the castle and the remaining destinations. Built in the 11th-century and rebuilt several times since, the castle complex contains many buildings for you to explore. If it’s still early in the afternoon, you may have enough time to enjoy the Escape the Castle game. Think of it as an escape room set in a historic castle. It’s a lot of fun! Before you leave the complex, make sure that you turn around and take in the view of the city. From the top of the hill, you get great views of Ljubljana, including most of Old Town and the edges of the modern parts of the city. After you get back down the hill, head north to the river, where you’ll reach the next footbridge. When you see the sculptures, you’ll know where the name of the bridge comes from. 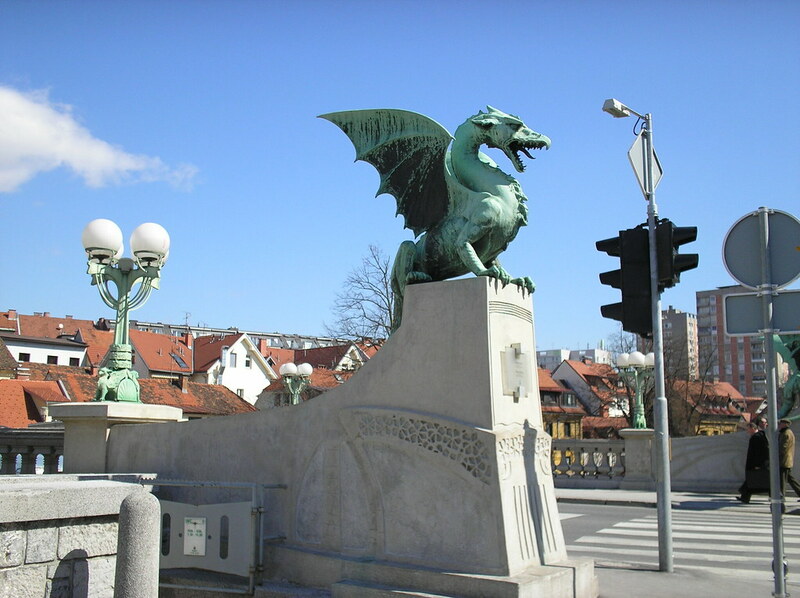 Dragon Bridge includes four large sculptures of dragons, standing guard on each end of the bridge. The legend goes that Jason, the ancient Greek hero, founded Ljubljana. The bridge commemorates Jason and the Argonauts defeating a dragon. Despite the interesting sculptures, the bridge doesn’t get as much traffic as Triple Bridge. You may have time to stop and take some photos. Crossing the bridge takes you back to the other side of the river and closer to the next destination. Take any of the streets west, and you’ll eventually reach Tivoli Park. For a city that now has numerous parks and green spaces, Tivoli Park stands out as the largest of them all. 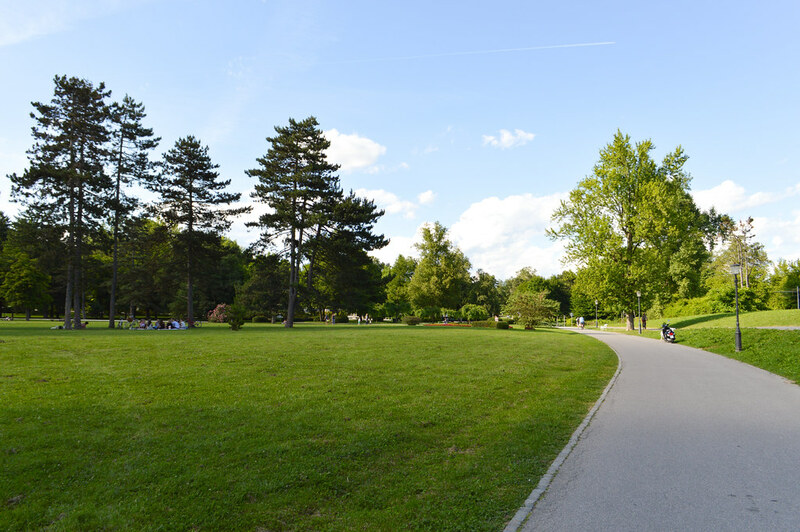 The sprawling park includes numerous walking trails, cutting through forests and open fields. Some people consider it the most beautiful public park in Europe. The main reason to visit the park is to get away from the crowds and get some fresh air, but there are also some attractions inside the park. You can visit a botanical garden, tour several old mansions, or simply stretch your legs and take in the surrounding plant life. As you walk the trails of the park, you may start to get a bit hungry or thirsty. It should also be getting dark and near the end of your 24 hours in Ljubljana. To quench your thirst or fill your stomach, walk back to the river. In the evening, the river becomes lively, as tourists and locals start to cram into the various bars and restaurants that line the banks. Some of the best bars and restaurants are found on the stretch of land between Triple Bridge and Cobbler’s Bridge. Unwind, relax, and rest your legs as you call it a day. Bed & Breakfast Atticus: A perfect choice for anyone looking to save a little cash without sacrificing location. Rooms here are comfortable and available with both private & shared bathrooms. Breakfast is included. City Hotel Ljubljana: A superb mid-range hotel located in the heart of the city. Many of the major stops in this itinerary are within quick walking distance. Vander Urbani Resort: A brilliant luxury design hotel located steps away from the best of Old Town. You’ll absolutely adore the rooftop terrace pool in the summer!